The northern lights shine over La Baie in Quebec at 2 a.m. Saturday, in a picture taken by Laurent Silvani. To see more of Silvani's work, check out his Silvani.ca website and his Facebook page. 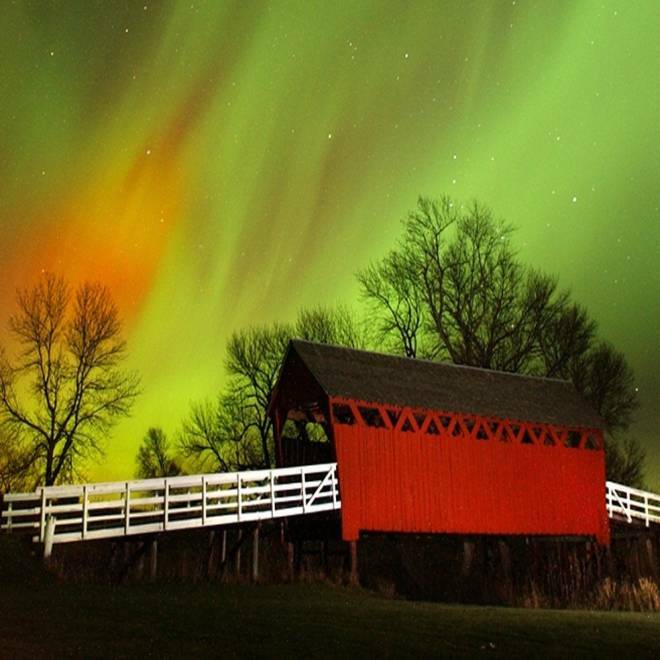 A slight solar storm ejected from a powerful sunspot sparked northern lights as far south as Colorado on Friday night — and there should be more to come. The heightened aurora was sparked by a burst of electrically charged particles thrown off from an active spot on the sun known as Region 1748. That region is the one responsible for four powerful X-class flares that blasted out from the sun this week. Region 1748 is just now turning in our direction, and forecasters at the National Oceanic and Atmospheric Administration's Space Weather Prediction Center say it has the potential to throw some hefty storms our way. Storms from the sun have the potential to disrupt satellite communications and power grids, and in extreme cases, the radiation risk could force airlines to reroute their intercontinental flights to lower latitudes. But Joe Kunches, a spokesman for the prediction center, said experts now have much better capabilities at their command to reduce the risks. And so far, he said, the active sun has been throwing "softballs" at us — at least compared with bigger flare-ups like the Halloween storms of 2003 or the Bastille Day storm of 2000. The most noticeable effects of recent solar disruptions have come in the form of enhanced auroral displays. SpaceWeather.com reports that faint glows were recorded Friday night in Colorado as well as Vermont, New York, Michigan, Wisconsin, Iowa and Washington state. Farther north, the fireworks show was significantly brighter. Astrophotographer Laurent Silvani captured some great images from Quebec's Saguenay region, about 100 miles (160 kilometers) north of Quebec City. "Following a magnetic storm, the aurora borealis was particularly visible in the sky with its waves and colors. A particularly beautiful sight!" he wrote in an email. "Many people from the Saguenay do not know that there are auroras occasionally here. They are surprised to see my pictures every time." Check out Silvani's website and Facebook page for more. For additional views of auroral glories — including, yes, some photos of the southern lights as seen from Antarctica —take a spin through SpaceWeather.com's photo gallery. And who knows? You might be able to catch the show yourself over the next couple of nights. Another geomagnetic storm is expected to sweep over Earth's magnetic field on Sunday, according to the Space Weather Prediction Center. To find out what can be seen from where, keep an eye on the center's Facebook page as well as its Ovation aurora forecast maps. If you're in the aurora zone, the best time to look is after midnight. The best places are far away from city lights, with clear, crisp skies. Got pictures? Share them with us via NBC News' FirstPerson photo upload page. Shawn Malone presents North Country Dreamland from LakeSuperiorPhoto on Vimeo. "All scenes are within approximately 200 miles of my home in Marquette, Michigan," he writes. "This video is my first time-lapse compilation of a resultant 10,000 photo frames equaling 33 scenes of various night sky events from Northern Michigan 2012. It took a year to shoot and a bit of tenacity and persistence to get this into a form of coherent electrified cosmic goodness." You'll see northern lights as well as meteors and other wonders. For the best effect, watch it at full screen in HD. And for more from Malone, check out his website and Facebook page. Thomas Kast presents Aurora - Queen of the Night on Vimeo. "After a long winter here in Finland with many beautiful northern lights, I'm very happy and proud to share my timelapse video of the aurora borealis with you," Kast writes. "This is the result of almost 60 nights outdoors between September 2012 and March 2013. Some of the scenes are shot on the frozen Baltic Sea, some in Lapland and most around Oulu, where I live."